This radar image of potentially hazardous asteroid Bennu (previously known as1999 RQ36) — the target of NASA's Osiris-Rex sample-return mission — was obtained by NASA's Deep Space Network antenna in Goldstone, Calif. on Sept 23, 1999. Bennu is an asteroid that whizzes past Earth every few years. In fact, there is a chance — though a slim one — that the asteroid will collide with Earth in the near future (less than 200 years from now). Because it flies so close to our planet, the near-Earth object (NEO) is the target of a NASA mission to collect a sample and return it to Earth. Scientists think the space rock may contain the building blocks of life. Bennu was discovered by the Lincoln Near-Earth Asteroid Research (LINEAR) project, which detects and tracks near-Earth objects, in 1999. It was provisionally named 1999 RQ36, which indicates that it was the 916th object observed in the first half of September 1999, according to the Planetary Society. After its orbit was precisely measured, the object was given an official sequential number, and because 1999 RQ36 was the 101,955th asteroid to receive a number, its official name became Asteroid 101955. The name Bennu was selected after a "Name That Asteroid!" contest held by the University of Arizona and other partners. Michael Puzio, a third-grade student in North Carolina, suggested using the name of an Egyptian mythological bird. Michael said the shape of the spacecraft (including its outstretched sample arm) reminded him of the heron god, which was called Bennu. Only about 5 percent of numbered asteroids have been given names, according to the Planetary Society. This graphic depicts the orbits of asteroid Bennu (previously known as 1999 RQ36) and the terrestrial planets in our solar system. The asteroid is the target of NASA’s Osiris-Rex sample-return mission. Bennu is part of a small class of carbonaceous (dark) asteroids that likely have primitive materials in them. Called a B-type class, Bennu and other asteroids like it have materials such as volatiles (compounds with a low boiling point), amino acids and organic molecules that are all may have been precursors to life on Earth, according to the University of Arizona. Measurements through telescopes (including the Arecibo Observatory Planetary Radar and the Goldstone Deep Space Network) suggest that Bennu has a density less than rock, according to NASA. The agency describes Bennu as a "rubble pile" that is a loosely-held-together group of dust, rock and boulders with gaps inside. Spitzer Space Telescope observations in 2007 suggested that Bennu has moderate-sized regolith (soil) grains across its surface; multiple other observations also hint that Bennu is likely a smooth object. Because Bennu is so dark, it tends to absorb the sun's radiation. Bennu then radiates this in turn as heat, which affects its orbit. This "push" on Bennu's orbit is called the Yarkovsky effect. Bennu's orbit and shape are also shaped as it repeatedly passes close to Venus and Earth, NASA added. The size of asteroid Bennu, which is 1,614 feet (492 meters) wide, is compared with the Empire State Building and Eiffel Tower in this NASA image. Asteroids such as Bennu are useful for astrophysicists because they tell scientists about the conditions under which the solar system formed. The leading theory for the solar system's formation— in a nutshell — states that a nebula (cloud of gas) was disturbed by an outside event, such as a stellar explosion. The nebula contracted and in its heart, some of the material coalesced into our sun. Surrounding the young sun was a disc of rock and gas that over time, gradually came together into the planets we observe today. The planets formed out of building blocks called chondrules, which originated as molten rock. Scientists suggest that Bennu also may have a lot of chondrules within it. "On planets like Earth, the original materials have been profoundly altered by geologic activity and chemical reactions with our atmosphere and water. We think Bennu may be relatively unchanged, so this asteroid is like a time capsule for us to examine," stated Edward Beshore, deputy principal investigator at the University of Arizona, in a 2015 NASA statement. Bennu may have been formed out of a collision. Crashes were common in the early solar system because there was so much material floating around. There are several huge impact craters in the solar system between the ages of 3.8 billion and 4.1 billion years old, suggesting that there might have been a "late heavy bombardment" where asteroids smacked into several planetary bodies. Some theories suggest that the bombardment happened after Jupiter migrated closer in to the sun, disrupting small bodies along its way, according to NASA. Bennu's collision – if it happened at all – likely occurred a little later, roughly one billion years ago. Bennu was formed from the debris after a planetesimal (a small body on its way to growing large enough to become a planet) crashed into an asteroid. An artist's concept of NASA's OSIRIS-REx asteroid sampling spacecraft at the asteroid Bennu. The probe is due to arrive at Bennu in 2018 and return samples to Earth in 2023. Bennu is the target of the OSIRIS-REx (Origins, Spectral Interpretation, Resource Identification, Security, Regolith Explorer) mission. OSIRIS-REx will arrive at Bennu in December 2018 and among other activities, scoop up a sample that will be returned to Earth in 2023. 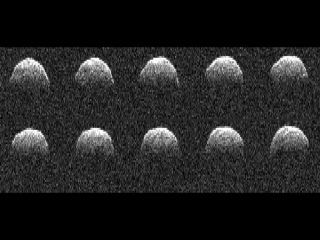 OSIRIS-REx will also document the sample site, map the asteroid, measure the Yarkovsky effect and compare its observations to ground-based telescopes, according to the University of Arizona. The scientists are also hunting for organic matter, which includes molecules such as carbon and hydrogen. Organics are key to life on Earth. While not all organic molecules are for life processes, studying them on locations such as Bennu give scientists an idea as to how organics might have spurred the origin of life. "By bringing this material back to Earth, we can do a far more thorough analysis than we can with instruments on a spacecraft, because of practical limits on the size, mass, and energy consumption of what can be flown," Beshore added. "We will also set aside returned materials for future generations to study with instruments and capabilities we can't even imagine now." OSIRIS-REx managers chose Bennu from 7,000 near-Earth asteroids known in 2008, when the mission was selected to go forward, according to the University of Arizona. Bennu had an orbit allowing for sample return, it had a small diameter (less than 200 meters or 650 feet) and it also was carbon-rich. At the time, there were only five known asteroids that met all of those parameters, and Bennu was chosen from them. Bennu is one of the most dangerous "potentially hazardous asteroids" that come within Earth's neighborhood, according to a study led by University of Arizona principal investigator Dante Lauretta that was published in 2015. Bennu has a 1-in-2,700 chance of impacting the Earth sometime in the late 22nd century. It is more likely, however, that Bennu would impact Venus rather than Earth. But its orbit could change over time. The investigators added: "It [Bennu] will most likely end its dynamical life by falling into the sun ... There is a chance that Bennu will be ejected from the inner solar system after a close encounter with Jupiter." Nevertheless, scientists and engineers with the U.S. government have drawn up plans for a spacecraft that could knock big, incoming space rocks off course via blunt-force impact or blow them to bits with a nuclear warhead, BuzzFeed News reported. The researchers announced the concept vehicle, known as the Hypervelocity Asteroid Mitigation Mission for Emergency Response (HAMMER), in a study in the February issue of the journal Acta Astronautica. And the team will discuss HAMMER at an asteroid-research conference in May, according to BuzzFeed News. Each HAMMER spacecraft would weigh about 8.8 tons (8 metric tons). If an asteroid threat is detected early enough, a fleet of the vehicles could be dispatched to collide, nuke-free, with the space rock, changing its trajectory enough to spare Earth from an impact. To arrive at these results, and refine HAMMER's design, the team modeled how to deal with a potential real-life scenario: What if Bennu was headed right for our planet? "Bennu was selected for our case study in part because it is the best-studied of the known NEOs," the researchers wrote.